Even though proper preparation prevents poor performance, I sometimes find it fun to descend upon a city with little to no prior knowledge of its offerings. Not the best strategy in the world for a travel writer, but I will admit that the surprise and awe that comes from having no expectations about a destination is one of my favorite parts of travel. View of Montreal from Mont Royal. Last week I descended upon Montreal without a clue in the world (like a good little American traveler, my Canadian friends would joke), experiencing it all for the first time and blowing with the wind based on loose recommendations from colleagues, friends, and fellow travelers. Montreal jumped out at me in many ways, the first big surprise needing no introduction. It was staring me in the face the moment I arrived: There’s a mountain in the middle of the city. All right, it’s more of a hill, but don’t tell the Montrealers that. Regardless of your perception of its size, it’s hard to argue that it’s not beautiful. Jacques Cartier named the area “Mont Real,” which is French for Mount Royal, after climbing the hill and gazing out upon the land (those interested in the specific history can read more here). 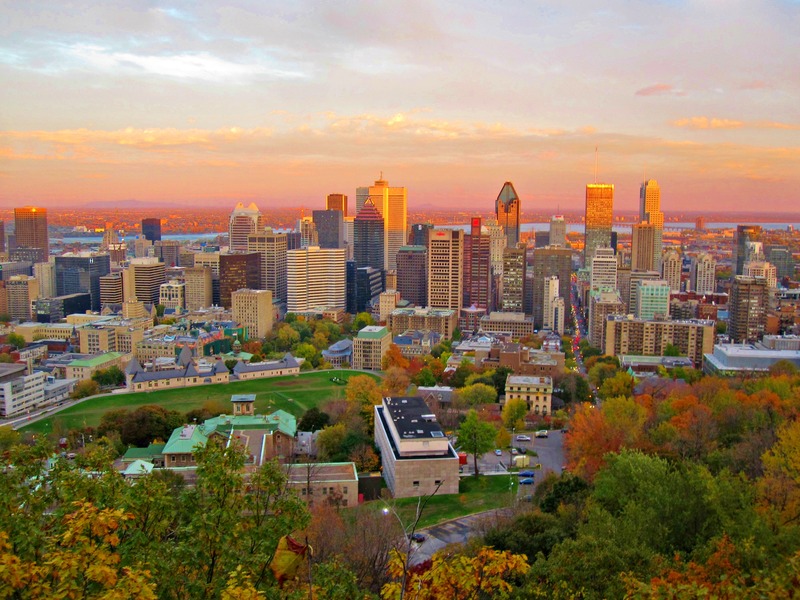 I had the opportunity to climb Mount Royal while in town, and you can see some photos below of the view. I timed it pretty well with not only the sunset, but the peak of the fall colors in the area. 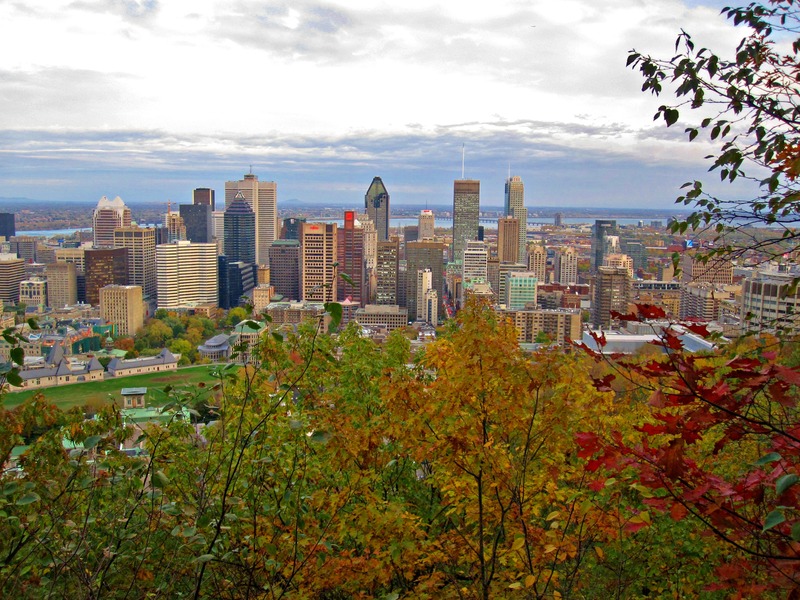 Mount Royal is a combination of residential areas, hiking/walking trails, and public space. Montreal is an island. Don’t believe me? See for yourself. It is 141 square miles as compared to Manhattan’s 34 square miles. Montreal has a 20-plus mile underground city. Our guide told us that Montrealers aren’t moles, but it seems like they pretend to be in the winter. The underground city not only houses the metro, but it connects hotels, apartments, office buildings, and thousands of shops all over the city. With an average January temperature of around 16 degrees Fahrenheit, this network seems to be more of a necessity than a luxury. It can be pretty “mazy” at times – a bit of a labyrinth – but it beats the hell out of a ripping winter wind in your face. Keep a close eye on the signs and you’ll be fine. Montrealers have mad skills when it comes to languages. Really mad skills, actually. Quebec as a province is ripping it up, with about 40% of its residents reportedly bilingual and 16% speaking a third language (the tourism board estimates it to be about 25% speaking a third language within the city of Montreal, although I haven’t been able to confirm that stat). That’s ridiculously impressive, considering we barely get around to a second language here in the United States. French is the official language in Montreal, and it is the second-largest French-speaking city in the world behind Paris. Although there are restrictions against signs in languages other than French in an effort to preserve their culture, I did not have a problem in any part of town speaking English alone. That said, meeting residents of all ages who had comfortable control of two (if not three or four) languages was really inspiring. I found myself mumbling French under my breath throughout my trip, cursing my ignorant youth as well as the educational processes that have left Americans in the dust when it comes to language skills. Jerry Seinfeld and Jim Carey were discovered at the Montreal Comedy Festival. I won’t get into what the definition of “discovered” means, but it turns out Canada has more to offer the comedy world than material for American comedians. “Just for Laughs” is the world’s largest comedy festival held every summer in the city – a good event to plan a trip around during the warmer months.